(NARRATOR)>> TODAY OUR "KLASSY KFIVE" IS BUTTONED UP AND HITS THE TRAIL. (LT)>> WHAT ARE YOU TALKING ABOUT HITTING THE TRAIL? IT'S NOT EVEN WIRED YET. (LT)>> WHAT'S WITH THIS GUY? (NARRATOR)>> WE'LL ELECTRIFY OUR '89 FULL SIZE WITH CUSTOM HOW TO ON BUILDING A WIRING HARNESS. PLUS GLASS WINDSHIELDS 101. THAT AND MORE RIGHT NOW ON TRUCK TECH. (JEREMY)>> WHAT ARE YOU DOING BACK THERE? (LT)>> CLEANING UP YOUR MESS. (LT)>> YOU GOT ALL THESE PARTS OUT AND DIDN'T PUT THEM AWAY. 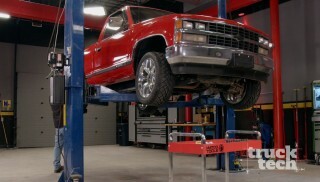 (JEREMY)>> HEY GUYS, WELCOME TO TRUCK TECH. WE FINALLY GOT OUR BLAZER BACK IN HERE AND THERE'S NO DOUBT WE'VE GOT HER LOOKING REALLY GOOD, BUT THERE'S A LOT OF WORK LEFT TO DO. NOW IF THERE'S ONE THING I KNOW ABOUT YOU, YOU DON'T LIKE BLOCK SANDING. 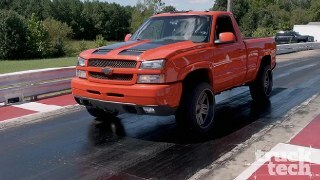 (JEREMY)>> AND IF YOU KNOW A LITTLE BIT ABOUT ME I DON'T REALLY LIKE WORKING ON DIESEL PICK UPS. (LT)>> I THINK YOU DO YOU JUST DON'T LIKE TO ADMIT IT, BUT OKAY. (JEREMY)>> BUT THERE'S ONE THING I THINK WE BOTH HAVE IN COMMON. (LT)>> OKAY, LET ME HEAR IT. (JEREMY)>> WE DON'T LIKE TO WIRE. (LT)>> YOU KNOW I REMEMBER BACK WHEN WE WERE TEARING THIS BLAZER APART I SAID TO MYSELF, CAUSE YOU REMEMBER WE WERE SITTING UNDERNEATH THE DASH BOARD, WE WERE PULLING A BUNCH OF STUFF OUT, AND I SAID, I FEEL BAD THE GUY THAT HAS TO PUT THIS ALL BACK IN. (JEREMY)>> YEAH, I'M NOT DOING THAT. (LT)>> THIS IS ONLY HALF OF IT. SO I THOUGHT YOU MIGHT SAY THAT. SO I CALLED IN SOME BACK UP. (JEREMY)>> YOU'RE A GOOD MAN. (LT)>> GUYS MEET THE MAN WHO'S GONNA BAIL US OUT, SCOTT BOWERS WITH RON FRANCIS WIRING. (SCOTT)>> WHAT'S GOING ON GUYS? (JEREMY)>> MAN I'M HAPPY TO SEE YOU. (LT)>> SO LIKE WE TALKED ABOUT A LITTLE BIT EARLIER ON THE PHONE WE'VE GOT AN '89 KFIVE BLAZER, AND AS FAR AS SQUARE BODIES GO IT'S KIND OF A SPECIAL YEAR BECAUSE IT HAD FUEL INJECTION, CRUISE CONTROL, AND A WHOLE LOT OF OTHER ELECTRONIC STUFF, AND WE REALLY AREN'T GONNA USE MUCH OF IT. (SCOTT)>> YEAH THE TRICK IS IF YOU START TRYING TO USE THAT FACTORY HARNESS AND YOU'RE TAKING THOSE ITEMS OFF YOU HAVE A LOT OF EXTRA WIRES YOU DON'T KNOW WHAT TO DO WITH. THAT'S WHERE WE COME IN. SO WE'VE GOT ONE OF OUR EXPRESS WIRING KITS THAT'S GONNA WIRE UP ALL THE CIRCUITS THAT YOU'RE GOING TO KEEP. I HEAR YOU'VE GOT A COUPLE OF ACCESSORIES, ELECTRIC FANS? (JEREMY)>> YEAH WE REALLY WANTED TO SIMPLIFY THINGS. SO JUST A CARBURETOR, ELECTRIC FUEL PUMP, ELECTRIC FAN, OBVIOUSLY THE LIGHTS AND EVERYTHING, BUT IT'S GONNA BE PRETTY STRAIGHT FORWARD AND SIMPLE, AND JUST LIKE YOU SAID WITH THE FACTORY HARNESS. WHEN YOU LOOK AT THAT THING IT'S NASTY, IT'S 30 YEARS OLD. IF YOU TORE IT DOWN, CLEANED IT UP, YOU'VE GOT THE BRITTLE ENDS. YOU'VE GOT WIRES THAT COULD BE SHORTED OUT OR BROKEN. SO WHY NOT REPLACE IT ALL? SOMETHING THAT GOOD ESPECIALLY. (SCOTT)>> EXACTLY, NICE WIRING IN A NICE TRUCK, HOW ABOUT THAT? SO FIRST THING WE NEED TO DO IS MOUNT THE FUSE PANEL. CAN WE GET THAT GOING? (JEREMY)>> YEAH, I'VE GOT A GOOD PLACE FOR THAT. (LT)>> WE'RE MOUNTING THE FUSE BLOCK UNDERNEATH THE DASH IN THE SAME SPOT AS THE ORIGINAL. IT GETS SECURED WITH FOUR NUMBER 10 SCREWS AND NYLOCK NUTS. WE'RE ALSO INSTALLING A JUNCTION BLOCK ON THE FIREWALL IN THE SAME LOCATION AS THE ORIGINAL. (SCOTT)>> THIS IS GOING TO BE ONE OF THE MAJOR POWER FEED CIRCUITS. SO WE'D LIKE TO SOLDER THIS TO MAKE THE BEST CONNECTION IT CAN BE. IN DOING SO WE'RE GONNA SOLDER IT BUT THERE IS SOME TRICKS TO SOLDERING. YOU DON'T WANT TO USE SO MUCH SOLDER THAT IT GETS WICKED UP IN THE WIRE AND IT ENDS UP MAKING THE WIRE BRITTLE BECAUSE IT'S STIFF AND IT WON'T FLEX ANY LONGER. SO WE'RE GONNA PUT JUST ENOUGH SOLDER IN THERE TO SEAL UP THE BARREL OF THE RING TERMINAL BUT NO MORE THAT WOULD ALLOW THE SOLDER TO BE SOAKED UP INTO THE WIRE ITSELF. WELL THAT WAS A LITTLE TIP FOR YOU DOING THIS AT HOME. YOU DON'T WANT TO USE A LOT OF SOLDER. SO THIS IS ONE OF THOSE CASES WHERE MORE ISN'T BETTER. WITH THE PARTS THE GUYS HAVE INSTALLED IN THE KFIVE BLAZER WE'RE GONNA HAVE THREE MAJOR GROUPS OF WIRES. WE START WITH THE ENGINE GROUP, WHICH WILL INCLUDE WIRING FOR THINGS LIKE THE ALTERNATOR, DISTRIBUTOR, STARTER, AND GAUGES. (LT)>> THERE ARE A FEW SENSORS I'LL HAVE TO INSTALL INTO THE ENGINE AND TRANS. A TEMPERATURE SWITCH FOR OUR COOLING FANS, A TEMP SENDING UNIT FOR THE CLUSTER, AND A VEHICLE SPEED SENSOR FOR OUR SPEEDOMETER. WITH ALL THE WIRING CONNECTED ONTO THE ENGINE, WE'LL PASS THE FIRST GROUP OF WIRES THROUGH A GROMMET AND INTO THE CAB WHERE WE'LL CONNECT THEM LATER ON. THEN EVERYTHING'S MORE OR LESS THROUGH. (NARRATOR)>> LATER ON "KLASSY" GETS GLASSY. (LT)>> WE'RE BACK ON TRUCK TECH WHERE SCOTT FROM RON FRANCIS WIRING IS HELPING GET OUR KFIVE ELECTRIFIED. WE HAVE MOST OF THE WIRES FOR THE FRONT AND REAR SECTION PASSED THROUGH THE FIREWALL, AND THE NEXT JOB IS TO SORT THEM FOR FRONT AND REAR SECTIONS. (SCOTT)>> I LIKE USING ELECTRICAL TAPE SPARINGLY. IT'S MORE OF AN ORGANIZATION PROCESS FOR ME, AND THEN GETTING INTO WIRE COVERINGS TO FULLY PROTECT THEM AND DRESS THEM DOWN REAL NICE. AFTER THE ENGINE SIDE THE SECOND MAJOR BRANCH OF WIRING RUNS UP FRONT AND INCLUDES THINGS LIKE THE COOLING FAN AND THE HORN, AS WELL AS HEADLIGHTS, RUNNING LIGHTS, AND TURN SIGNALS. IT'S VERY IMPORTANT TO USE THE RIGHT CONNECTOR SYSTEM FOR THE JOB. IN THE FRONT OF THE VEHICLE WHERE IT GETS WET NEAR THE HEADLIGHTS WE'RE GONNA USE A CONNECTOR SYSTEM THAT'S SEALED FROM THE ELEMENTS. SO THIS IS A TYPICAL WEATHER PAK CONNECTOR SYSTEM. IT HAS BOTH A SEAL THAT GOES ON THE WIRE TO SEAL THE WIRE PORTION, PLUS A GASKET TO SEAL THE TWO HALVES OF THE CONNECTOR. LET ME SHOW YOU HOW THEY GO TOGETHER. FIRST STEP IS TO PUT THE GROMMET ON. NEXT WE PUT THE TERMINAL ON. AND THEN INSERT IT IN THE CONNECTOR. COMPLETE THE PROCESS FOR ALL PINS IN THE CONNECTOR. FOLD DOWN THE SECONDARY LOCK AND YOU'RE DONE. (JEREMY)>> ALL RIGHT, THANKS MAN. NOW IF YOU GUYS REMEMBER ON THESE '89 BLAZERS THE HEADLIGHTS WERE ACTUALLY SIDE BY SIDE. WE DID A LITTLE FRONT END CONVERSION ON THIS AND SWAPPED IT OVER TO A MID '80'S STYLE SO WE HAVE THE STACKED HEADLIGHTS. THOUGHT THAT'D LOOK A LITTLE BETTER ON OUR BLAZER. NOW UP TOP WE'VE GOT THE LOW BEAMS, WHICH IS A THREE PRONG PLUG, AND DOWN LOW WE'VE GOT THE HIGH BEAMS, WHICH IS A TWO PRONG. (LT)>> THE LAST MAJOR GROUP OF WIRES GOES TOWARDS THE REAR OF THE TRUCK. WE'LL BE INCLUDING CIRCUITS FOR THE ELECTRIC FUEL PUMP, GAS TANK SENDING UNIT, OF COURSE THE REAR TAILLIGHTS, AND WIRING FOR THE POWER WINDOWS IN THE BLAZER'S TAILGATE. (SCOTT)>> ONCE THE WIRES ARE ALL PULLED TO THE REAR I'LL SPLIT THE HARNESS BETWEEN THE DRIVER'S SIDE AND THE PASSENGER'S SIDE, AND THEN WRAP THE HARNESS. 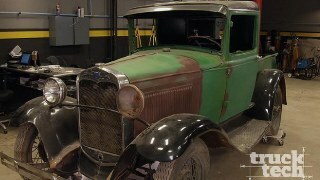 WHEN WIRING A TRUCK LIKE THIS I ALWAYS PLAN AHEAD AND THINK ABOUT SERVICING IT LATER ON. SMALL THINGS LIKE ADDING A PLUG AT THE TAILLIGHT MAKES FOR REAL EASY BULB CHANGES WHENEVER THE TIME COMES. (LT)>> THE FINISHING TOUCH ON THE REAR ARE SOME NEW TAILLIGHTS WE PICKED UP FROM LMC TRUCK. (SCOTT)>> THE FINAL STEP IS MAKING CONNECTIONS AT THE FUSE PANEL. WE'LL TRIM THE WIRES TO LENGTH, STRIP THE END OF THE WIRE, CRIMP ON A CONNECTOR, AND ATTACH IT TO ITS HOME ON THE PANEL. OUR SYSTEM MAKES IT REAL EASY BECAUSE EVERY WIRE IS LABELED. SO IT'S JUST SIMPLE AS WIRING BY NUMBER. ALL RIGHT GUYS, SO DO WE HAVE HEADLIGHTS? (LT)>> ALL FOUR OF THEM. (JEREMY)>> HEY MAN IT LOOKS GOOD! (JEREMY)>> WELL I GUESS WE'VE GOT EVERYTHING MOST WIRED UP. SO WE'RE MAKING MORE PROGRESS EVERYDAY. (LT)>> YOU KNOW I'LL TELL YOU THIS. THIS WAS THE EASIEST HARNESS THAT I'VE HAD TO INSTALL SO FAR. (SCOTT)>> YOU REALLY WANT TO TAKE CREDIT FOR THIS DON'T YOU? (LT)>> I DO IT TO HIM ALL THE TIME, SO ABSOLUTELY! (SCOTT)>> MY PLEASURE, I WAS HAPPY TO HELP. (LT)>> YEAH, THANK YOU SCOTT FOR KNOCKING THIS OUT. IT'S A BIG HELP FOR US. (SCOTT)>> NO WORRIES, GOOD LUCK WITH THE PROJECT. (LT)>> SO WOULD YOU DRIVE THIS IF IT WERE YOURS? 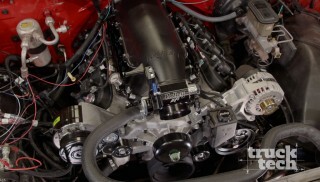 (SCOTT)>> ABSOLUTELY, I'M SUCH A BIG FAN OF SUPERCHARGERS. (NARRATOR)>> NEXT OUR OTHER JEREMY ADDS SOME GLASS TO THE SHOW. (LT)>> WHEN IT COMES TO FINAL ASSEMBLY OF YOUR RESTORATION PROJECT IT'S USUALLY JUST A MATTER OF BOLTING STUFF BACK TOGETHER BECAUSE ALL THE ENGINEERING AND DESIGN WORK HAS ALREADY BEEN DONE. THERE ARE A FEW TIMES WHEN PEOPLE LOVE TO CALL IN THE EXPERTS THOUGH. WIRING IS DEFINITELY ONE OF THEM BUT THE OTHER IS USUALLY AUTO GLASS. WHEN IT COMES TO PUTTING IN WINDSHIELDS THAT'S ONE THING PEOPLE LOVE TO HAVE A LITTLE BIT OF HELP ON. NOW ON A LOT OF MODERN VEHICLES THE WINDSHIELD'S ACTUALLY GLUED TO THE BODY, MAKING IT PART OF THE STRUCTURE OF THE VEHICLE. THE SURFACE IS FIRST PREPARED WITH A PINCH WELD PRIMER, WHICH HELPS IMPROVE ADHESION. THEN A SPECIAL HIGH STRENGTH URETHANE ADHESIVE IS APPLIED AND THE WINDSHIELD IS SET INTO PLACE AND TAPED WHILE THE GLUE CURES. 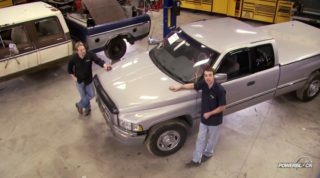 IT CAN BE A BIT TRICKY TO GLUE A WINDSHIELD ONTO THE BODY OF A VEHICLE, BUT ON A LOT OF OLDER VEHICLES THE WINDSHIELD'S ACTUALLY HELD IN PLACE WITH A RUBBER GASKET, AND THAT'S SOMETHING THAT YOU CAN EASILY INSTALL WITH JUST THE HELP OF A FRIEND. 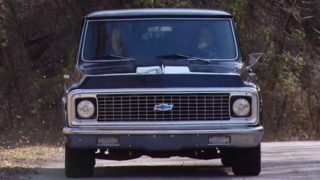 ON THE '67 TO '72 CHEVY TRUCKS THE WINDSHIELD USES A ROPE IN STYLE GASKET. YOU HAVE TO START BY LAYING THE WINDSHIELD DOWN AND SLIDING THE GASKET OVER THE EDGE OF THE GLASS ALL THE WAY AROUND THE PERIMETER. THEN YOU TAKE A SMALL ROPE AND LAY IT IN THE PINCH WELD GROOVE WITH THE LONG ENDS OVERLAPPING AT THE BOTTOM. 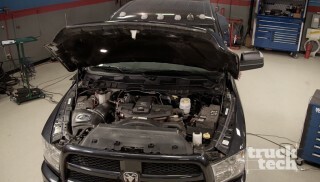 THEN YOU SET THE WINDSHIELD ONTO THE BODY OF THE TRUCK, AND BY PULLING THE ROPE THE RUBBER GASKET IS PULLED OVER THE PINCH WELD, LOCKING THE WINDSHIELD INTO PLACE AND CREATING A LEAK PROOF SEAL. 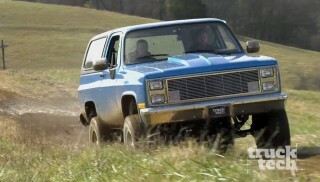 ON THE '73 TO '87 CHEVY TRUCKS, AND BLAZERS, AND SUBURBANS UNTIL '91 THE WINDSHIELD, IT STILL ACTUALLY ATTACHES TO THE BODY USING A RUBBER GASKET BUT IT GOES ON JUST A LITTLE BIT DIFFERENTLY, AND ALL YOU NEED ARE A FEW INEXPENSIVE TOOLS TO GET THE JOB DONE. THE FIRST IS SOME WAY TO INSTALL THE LOCKING STRIP INTO THE GASKET. NOW YOU CAN BUY A DEDICATED TOOL OR JUST HAVE A PICK WITH A BLUNT NOSE ON IT. THEN YOU NEED JUST A COUPLE OF SOFT PLASTIC WINDSHIELD TOOLS, AND THEN A LITTLE BIT OF SOAP AND WATER. (JEREMY W.)>> WELL LT THERE'S ONE MORE PIECE OF THE PUZZLE YOU'RE GONNA NEED. (LT)>> I SUPPOSE A WINDSHIELD PROBABLY WOULD HELP. GUYS, JEREMY FROM XOR. SO WHAT'S THE STORY, WHERE'D YOU FIND THIS? (JEREMY W.)>> WELL THERE WAS A BOX, OR AN LMC BOX, SITTING OUT IN FRONT OF OUR STUDIO, AND IT HAD JEREMY WRITTEN ON IT, AND I GUESS I NEVER LOOKED IN IT. WELL I OPENED IT UP TODAY AND I FOUND THAT IT'S THE GLASS FOR YOUR GUYS KFIVE. (LT)>> YOU WEREN'T HIDING THAT FROM ME WERE YOU? (JEREMY W.)>> NO, I WAS TRYING NOT TOO. (LT)>> WELL SINCE YOU BROUGHT IT DOWN I GUESS THAT MEANS YOU'RE GONNA GIVE ME A HAND PUTTING IT IN? (JEREMY W.)>> IF IT TAKES A COUPLE OF MINUTES, LET'S SEE WHAT HAPPENS. (LT)>> I'LL TELL YOU WHAT. GET THIS THING UNWRAPPED, I'LL GET THE GASKET ON. ALL IT TAKES IS A LITTLE PRESSURE AND THE GASKET SHOULD SLIDE RIGHT OVER THE PINCH WELD. IT GETS LUBED UP WITH A LITTLE SOAP AND WATER. ALL RIGHT, IF IT BREAKS IT'S ON YOU. AND THE GLASS CAN BE SET IN STARTING AT THE BOTTOM. SO FIRST THING JUST KIND OF GET THE BOTTOM SORT OF SET IN THE GROOVE THERE. THERE WE GO. USING THE PLASTIC TOOL, WE'LL WORK THE WINDSHIELD INTO THE GASKET. COME ON! OKAY! AND SECURE IT IN PLACE WITH A LOCKING STRIP. WELL WHAT DO YOU SAY, YOU WANT TO HELP ME DO THE SIDE GLASS? (JEREMY)>> I DON'T THINK SO. I THINK I'M GONNA GO WORK ON SOMETHING A LITTLE BIT BIGGER THAN THE BLAZER. (LT)>> GOOD LUCK MAN. YOU KNOW WHAT THEY SAY ABOUT BIG TRUCKS? (JEREMY W.)>> WHAT'S THAT? (NARRATOR)>> NEXT, STOPPING 8,500 POUNDS. (LT)>> WE'RE GONNA PUT THE BLAZER ASIDE FOR NOW AND TURN OUR ATTENTION TO THE 2016 RAM. 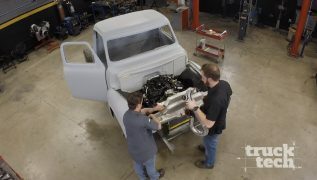 IT'S A BIG, HEAVY TRUCK AND WE'VE ADDED A WHOLE BUNCH OF GO FAST GOODIES UNDERNEATH THE HOOD, LIKE A LARGER TURBO, DUAL INJECTION PUMPS, A BIGGER INTERCOOLER, AND A WHOLE LOT MORE. WE HAVE A GOAL OF ABOUT 800 HORSEPOWER TO THE WHEELS, AND CLOSE TO DOUBLE THAT IN TORQUE, WHICH SHOULD GET THIS 8,500 POUND BEHEMOTH MOVING IN A HURRY. 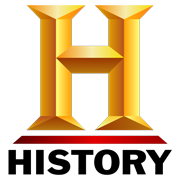 (LT)>> RIGHT NOW WE'RE ROLLING ON A SET OF STOCK WHEELS AND TIRES, BUT WE ACTUALLY HAVE A SET OF 37 INCH TALL MUD TIRES THAT WE'VE ORDERED FOR THIS THING THAT ARE ROLLING ON A 22 INCH WHEEL. THEY WEIGH ABOUT 140 POUNDS EACH, AND THERE'S TWO OF THEM PER SIDE. SO NEEDLESS TO SAY THERE'S A TREMENDOUS AMOUNT OF MOMENTUM THAT'S SPINNING AROUND BACK HERE BETWEEN JUST THE WHEELS AND TIRES, NOT TO MENTION THE 8,500 POUND TRUCK THAT'S SITTING ON TOP OF IT ALL. SO NEEDLESS TO SAY THIS THING COULD USE A BRAKE UPGRADE. WE WENT TO EBC BRAKES AND WE GRABBED A SET FOR ALL FOUR CORNERS. WE STARTED WITH THEIR GD SPORT ROTORS. NOW THESE HAVE BEEN MACHINED WITH A WIDE APERTURE SLOT AND HAVE BEEN DIMPLE DRILLED IN THE BRAKING SURFACE. THIS WILL HELP THE PADS RUN COOLER AND IT PULLS AWAY DUST. PLUS THEY HAVE A NICE LOOKING BLACK NITRO THERM FINISH, WHICH PREVENTS CORROSION AND KEEPS THE ROTORS LOOKING GOOD FOR A LONG TIME. FOR THE FRICTION MATERIAL WE GRABBED A SET OF EBC'S EXTRA DUTY PADS. THESE HAVE BEEN DESIGNED FOR TRUCKS AND SUV'S, AND NUMBER ONE, THEY'LL GIVE YOU MUCH MORE BRAKING POWER BUT NUMBER, THEY'RE MUCH MORE RESISTANT TO FADE. SO THEY GET MUCH MORE REPEATABLE STOPS TIME AFTER TIME. NOW THE BEST PART IS ALL THESE PARTS WILL INSTALL WITHOUT ANY MODIFICATION. IT'S JUST A DROP IN KIT, BUT FIRST WE NEED TO DO SOME CLEANUP. ...THE BRAKE PADS SLIDE INTO THE BRACKET. NEXT WE'LL HAVE TO PUSH THE PISTONS BACK INTO THE CALIPER, AND IT BOLTS BACK ON TO THE SLIDERS, COMPLETING THE FRONT. OUT BACK THINGS LOOK A BIT DIFFERENT. THE WHEEL BEARING IS LUBED UP AND A NEW SEAL GETS DRIVEN INTO PLACE. THEN THE EBC ROTOR BOLTS ONTO THE BACK OF THE HUB, FOLLOWED BY THE ABS RELUCTOR WHEEL. THE WHOLE ASSEMBLY SLIDES ONTO THE SPINDLE ALONG WITH THE OUTER WHEEL BEARING AND IT ALL GETS HELD INTO PLACE WITH AN AXLE NUT, KEYWAY, AND SIR CLIP. NOW THE AXLE SHAFT GOES BACK IN. FROM HERE THE REAR'S ASSEMBLED JUST LIKE THE FRONT, COMPLETING OUR BRAKE UPGRADE. THE TIRES FOR OUR RAM JUST SHOWED UP. THESE ARE RAZOR MT'S, THE FLAGSHIP NEW MUD TERRAIN FROM MAXXIS TIRES. NOW WE CHOSE A 37 BY 13.5 BY 22, AND WE MOUNTED THEM UP TO A SET OF AMERICAN FORCE DRAFT SUPER DUALLYS. NOW THIS TREAD HAS BEEN ENGINEERED WITH EXPERIENCE GAINED FROM OFF ROAD RACING FOR MAXIMUM TRACTION, WHICH WE'RE GONNA NEED WHEN WE HOOK THIS RAM UP TO THE PULLING SLED. NOW THE SIDEWALL HAS BEEN ENGINEERED FOR ADDITIONAL TRACTION AND PUNCTURE RESISTANCE, AND THE COMPOUND WILL GIVE YOU MAXIMUM TREAD LIFE AND A SMOOTH, QUIET RIDE. NOW WE CAN'T FIT THESE ON JUST YET. WE'RE GONNA HAVE TO WAIT TO INSTALL THE LIFT KIT. SO YOU GUYS ARE JUST GONNA HAVE TO HANG ON JUST A LITTLE BIT LONGER. CHOOSING A NEW WHEEL IS THE MOST EXCITING PART OF BUILDING A CAR OR TRUCK BECAUSE OTHER THAN CHANGING THE COLOR OF PAINT IT HAS THE BIGGEST IMPACT ON HOW YOUR PROJECT LOOKS. THE FIRST STEP, WELL THAT'S JUST PICKING OUT WHAT WHEEL THAT YOU WANT TO GO ON YOUR PROJECT, AND THERE ARE LITERALLY HUNDREDS AND HUNDREDS OF DIFFERENT OPTIONS OUT THERE. AND ONCE YOU HAVE YOUR DESIGN PICKED OUT THE JOB'S NOT DONE BECAUSE EACH INDIVIDUAL WHEEL COMES IN AT LEAST A DOZEN DIFFERENT SIZES, BETWEEN WIDTH, BOLT PATTERN, AND OFF SET. SO TODAY I'M GONNA GIVE YOU THE LOW DOWN ON WHEEL SPECS, AND I'LL START BY LISTING OFF ALL THE NUMBERS THAT ARE USED TO CLASSIFY A WHEEL. THIS IS A 20 BY NINE WITH AN EIGHT ON 170 BOLT PATTERN. IT HAS AN OFFSET OF PLUS 12 AND A BACK SPACING OF FIVE AND A HALF INCHES. NOW THERE'S A LOT OF DIFFERENT NUMBERS IN THERE, AND IT KINDA SOUNDS LIKE GIBBERISH, BUT TODAY I'M GONNA GIVE YOU THE BREAK DOWN OF WHAT ALL THOSE NUMBERS MEAN. WE'RE NOT MEASURING THE PHYSICAL SIZE OF THE WHEEL. THIS IS A 21.5 INCHES IN DIAMETER. WE'RE ACTUALLY MEASURING THE SURFACE THAT THE BEAD OF THE TIRE MOUNTS TO, WHICH IS JUST A LITTLE BIT INSIDE AT 20 INCHES, AND YOU CAN SEE THE SAME THING ON THE WIDTH. THE WHOLE WHEEL IS ACTUALLY 10 INCHES WIDE, BUT THE MOUNTING SURFACE OF THE BEAD IS NINE. NEXT WE HAVE BOLT PATTERN. THIS WHEEL IS AN EIGHT ON 170 AND THIS ONE IS A FIVE ON FOUR AND A HALF. THE FIRST NUMBER, THAT'S EASY BECAUSE IT'S JUST THE NUMBER OF BOLT HOLES THAT EACH WHEEL HAS. THE SECOND NUMBER IS THE DIAMETER OF AN IMAGINARY CIRCLE IN INCHES OR MILLIMETERS THAT RUNS THROUGH THE CENTER OF EACH OF THE STUDS, OR IN THIS CASE 170 MILLIMETERS. ON A FOUR, SIX, OR AN EIGHT LUG WHEEL IT'S ACTUALLY REALLY EASY TO MEASURE THE BOLT PATTERN. ALL YOU'VE GOT TO DO IS MEASURE FROM THE CENTER OF ONE STUD TO THE CENTER OF THE OTHER STUD THAT'S DIRECTLY ACROSS FROM IT, BUT ON A FIVE LUG WHEEL YOU CAN'T DO THAT BECAUSE THERE ARE NO TWO STUDS THAT ARE DIRECTLY ACROSS FROM EACH OTHER. YOU'LL HAVE TO MEASURE FROM THE CENTER OF ONE LUG TO THE OUTSIDE EDGE OF A HOLE THAT'S ACROSS FROM IT, OR IN THIS CASE FOUR AND A HALF INCHES. NEXT WE'LL TALK ABOUT BACK SPACING AND OFFSET, AND THERE'S TWO DIFFERENT WAYS TO BASICALLY EXPRESS THE SAME THING, AND THAT'S HOW FAR IN THE HUB MOUNTING SURFACE IS FROM THE BACK SURFACE OF THE WHEEL. SO FIRST WE'LL TALK ABOUT BACK SPACING BECAUSE THAT'S THE EASIEST TO MEASURE. I'LL JUST TAKE A STRAIGHT EDGE, PUT IT ACROSS THE BACK OF THE WHEEL, AND THEN TAKE A MEASUREMENT. THIS PARTICULAR WHEEL HAS A BACK SPACING OF FIVE AND ONE HALF INCHES. OFFSET IS JUST A LITTLE BIT DIFFERENT, AND IT ALL HAS TO DO WITH THE CENTER LINE OF THE WHEEL. OUR HUB MOUNTING SURFACE IS 12 MILLIMETERS TO THE OUTSIDE, WHICH GIVES US A PLUS 12 OFFSET, AND CONVERSELY IF THE HUB MOUNT WERE TOWARDS THE INSIDE WE WOULD HAVE A NEGATIVE OFFSET. SO NOW THAT YOU GUYS KNOW HOW TO ORDER WHEELS YOU CAN GO OUT AND GET A CUSTOM SET FOR YOUR CAR OR TRUCK. MODERN DIESEL PICK UP TRUCKS ARE MAKING MORE POWER THAN EVER STRAIGHT OFF THE SHOWROOM FLOOR, BUT THERE'S ALWAYS A LITTLE BIT EXTRA THAT CAN BE UNLOCKED IF YOU HAVE THE RIGHT TOOLS. THIS IS A BULLY DOG GT DIESEL AND IT WILL GET INSIDE YOUR TRUCK'S COMPUTER AND GIVE YOU A NICE BOOST IN HORSEPOWER AND TORQUE, WHICH WILL MAKE YOUR TRUCK A LOT MORE FUN TO DRIVE AND EVEN MORE CAPABLE ON THE JOB SITE. YOU CAN EVEN SWITCH POWER LEVELS ON THE FLY DEPENDING ON WHAT YOU'RE DOING, BUT IT WILL ALSO ALLOW YOU TO MONITOR YOUR ENGINE'S VITALS AS IT DISPLAYS LIVE DATA STRAIGHT FROM YOUR ECM. 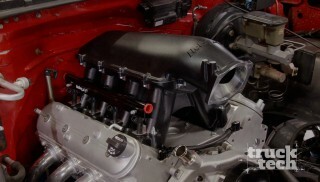 TO FIND OUT MORE ABOUT THE GT DIESEL OR ANY OF THEIR OTHER PRODUCTS BE SURE TO CHECK OUT BULLY DOG DOT COM. YOUR VEHICLE'S PAINT TAKES A BEATING YEAR ROUND, WHETHER IT'S FROM ROAD DEBRIS, TAR, BUGS, SAP, AND MORE, AND IF YOU DON'T TREAT IT YOUR VEHICLE'S PAINT WILL BECOME POROUS AND DULL. THE SOLUTION IS TO APPLY SOME SONAX PROFILINE CERAMIC COATING. IT'S VERY EASY TO APPLY AND IT COMES WITH EVERYTHING THAT YOU'LL NEED. IT PRODUCES A GLASS LIKE FINISH, IT IMPROVES GLOSS, AND ALSO IT RESISTS DIRT. SO YOUR VEHICLE WILL STAY CLEANER, AND IF IT'S APPLIED PROPERLY IT WILL LAST FOR UP TO THREE YEARS. SO FOR MORE INFORMATION CHECK OUT SONAX USA DOT COM. NOW IF YOU SAW ANYTHING IN OUR SHOW TODAY THAT YOU NEED TO FIND OUT MORE INFORMATION ON BE SURE TO CHECK OUT POWERNATION TV DOT COM. WE HAVE A WHOLE HOST OF PAST BUILDS, PRESENT PROJECTS, AND A WHOLE LOT OF COOL INFORMATION.